By the sacred anointing of the sick and the prayer of the priests the whole Church commends those who are ill to the suffering and glorified Lord, that he may raise them up and save them. The reception of this sacrament is available to any Catholic who finds themselves in grave physical, spiritual or mental state of illness. Arrangements should be made through the parish office for those who are homebound. If after hours, or on weekends, and the person is in imminent danger of death, leave a message. The phone is checked periodically throughout the day. 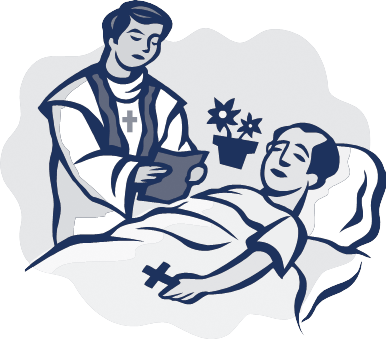 If you are having surgery you may ask a priest to anoint you before the surgery. Call the office to schedule an appointment. Please do not arrange for someone else to be anointed unless you are immediately related to the person in need and know they desire to receive the sacrament. This avoids embarrassing the priest and the ill person avoiding an otherwise awkward situation. Please note: It is best not to wait until the very last moment to call for a priest. There are situations when no priest is available and might be several hours away from responding.